Do you love the outdoors, but hate those pesky mosquitos? If so, you are just like everyone else in Baltimore. You want nothing more than to sit outside and relax on a cool spring, summer or fall evening, but those mosquitos have you running for cover. Now, what if you were covered and outdoors at the same time? How is this possible? The answer: a Screened Porch. Just think – no more bugs! A screened porch is a Great Place to Entertain. You are practically outside and you don’t have to worry about bugs. That’s what we like to call a win-win! A porch without a screen is an open invitation for flying bugs and insects, especially at night. Because it is attached to your home, a screened porch typically has Working Lights, allowing you and your guests to party well into the night. Even if you are not a party animal, a screened porch gives you plenty of Additional Living Space. You can quickly turn a cramped home into a more spacious abode. Throw in the Natural Light and Fresh Air, and you have yourself a pretty nice sitting room for any season. Your new porch will also help increase your Home Value. Curb Appeal is not No. 1 on the list, but it is No. 1 in our hearts. When done right, a screened porch can be an aesthetically pleasing addition to any house. The key phrase here is “when done right.” This means relying on a professional company, like Mid-Atlantic Deck and Fence. 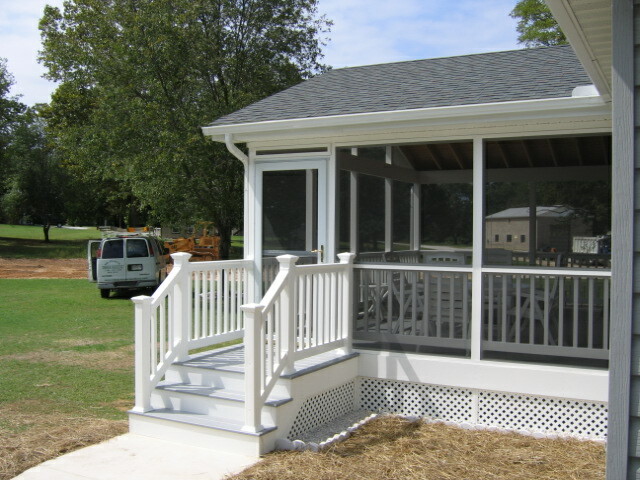 Mid Atlantic Deck and Fence offers a wide variety of screened rooms, from screened porches, screened pagodas, and screened gazebos. Please Click Here to review some of the projects we have completed over the years. Mid Atlantic Deck and Fence is one of the only companies in Baltimore that custom designs, builds and installs all of our own decks, fences, pergolas, pagodas, gazebos, and screened porches.. If you have any questions about Screened Porch Design and Installation in Baltimore, please contact Mid Atlantic Deck & Fence (MAD Fence) today by clicking here or calling 1-800-833-9310. You can also follow us on Facebook and Twitter as well.